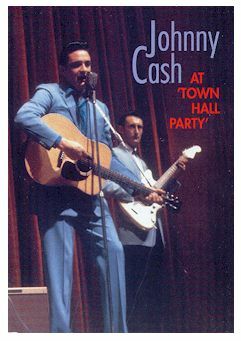 The 24 tracks on this DVD originate from two of Johnny Cash’s appearances on “Town Hall Party” The dates were 15th November 1958 and 8th August 1959 before we look in more detail at the tracks and Cash’s career at the time we should give a brief history of the show. “Town Hall Party” was California longest country music barn dance, running from 1952 until early 1961. The show was broadcast every Saturday night from a theater made up to look like an old barn, at 400 South Long Beach Boulevard in the Campton suburb of Los Angles. On a good night crowds numbering up to 2000 would fill the venue to see and hear the top artists of the day performing their hits. The First hour was broadcast live over KFI and reached a wider audience when NBC syndicated the show on radio. The broadcast was extended was extended to three hours when KTTV-TV televised the show on Channel Eleven. International coverage came from the Armed Forces Television Services. Jay Stewart (who later hosted the TV quiz show Lets Make A Deal ) and occasionally Tex Ritter, were the MCs and the house band was led by Joe Maphis, and included regulars like Merle Travis, Skeets McDonald Johnny Bond,and Tommy Duncan. Artists appearing on the show included the Collins Kids, Carl Perkins, Jim Reeves, Patsy Cline, Edie Cochran, Gene Vincent, Wanda Jackson, and of course Johnny Cash. The Show was so popular that, in 1958, Columbia Records issued the “Town Hall Party” album featuring cast members. In August 1957 following an appearance on “Town Hall Party” Cash was approached by Don Law with the idea of signing with Columbia Records at the expiration of his Sun contract. Cash agreed, but there was still a year to on his contract. On August 1958 he signed with his new label. He was already one of the most successful artists in the country music. His three years on Sun Records had resulted in a unbroken string of hits that included “I Walk The Line” “Folsom Prison Blues “Big River” and “Get Rhythm” the song that opens this DVD. Although Johnny Cash didn’t officially sign with Columbia until August he held his first session for the label on 24th July 1958 and among the tracks recorded were “it was Jesus “ and “Supertime”. In August he was back in the in the studio recording “All Over Again” which became the a-side of his first single for the label, as well as “Frankie Man Johnny” and Don’t take Your Guns To Town. 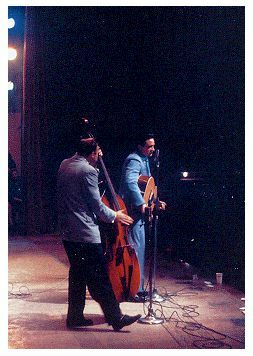 Throughout September, October and November1958 Cash was touring the Midwest on a package with Carl Perkins, Sonny James and Mitchell Torok.As the show moved into Texas, they added Bob Luman, Gordon Terry and Johnny Horton. Following the tour and on an appearance at the DJ-Convention in Nashville , Johnny Cash and The Tennessee Two appeared on “Town Hall Party” on the 15th November. The first eleven songs on this DVD are taken from that show. They opened with a record they had cut back at Sun Records in 1956 and one that had become a concert favorite with the fans, “Get Rhythm”. Cash returned to Sun for “You’re The Nearest Thing To Heaven” “I Was There When It Happened” “I Walk The Line” “The Was Of A Woman In Love” and Give My Love To Rose. The last two tracks had been recent success on the country charts and the opportunity to promote his latest Columbia single wasn’t missed, either. Both “All Over Again” and the follow-up, “Don’t Take You’re Guns To Town” were preformed. Cash’s first album for Columbia , “The Fabulous Johnny Cash” was issued in November, and included Frankie’s Man Johnny” as well as the song that closes this first show. Johnny Cash and the Tennessee Two were busy during 1959 with sessions, concert tours and more TV appearances. “Hymns By Johnny Cash” his first gospel album, was issued in May followed in September by “Songs Of Our Soil”. The latter featured “Five Feet High And Rising” the story of the 1937 Mississippi floods, which was paired with “I Got Stripes” for single release in July. Both these songs featured on the 8th August “Town Hall Party” appearance which makes up the remainder of this DVD. 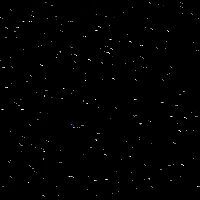 Once again Cash turns to his Sun catalogue for several songs and opens the show with “Guess Things Happen That Way” followed by “Folsom Prison Blues” and “Big River” two of his biggesthits for the label. “Don’t Take You’re Guns To Town” and “Frankie’s Man Johnny” were reprised for his show. 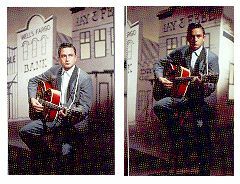 Around this time, Cash often used to perfrom a selection of impressions during his shows. Ernest Tubb, Red Foley, and Kitty Wells were just a few and on his show Cash turns a great impression of Elvis Presley performing “Heartbreak Hotel”. The show ends with a second performance of “I Got Stripes” There has been very little live material from the fifties released featuring Cash with Luther and Marshal, and even less on video, and this CVD captures all the excitement of those early shows.